The language of war is a precarious area. Quite often there’s significant meaning in the terms being used. For example, in Afghanistan, the U.S. is fighting militants. But in Iraq, the U.S. is fighting insurgents. Militants stormed Kabul’s most popular luxury hotel Monday, killing at least six people as they hunted down Westerners who cowered in a gym — a coordinated assault that could signal a new era of brazen Taliban attacks. Similar language was used in a report from National Public Radio. Meanwhile, in Iraq this week, according to the New York Times, it was insurgents who rigged a house to kill Americans. From the alleyway outside a day later, there was little sign that this was the house where the bomb exploded Wednesday, during an offensive to clear Sunni insurgents from the northern Diyala River valley, 60 miles north of Baghdad. Is there a difference? 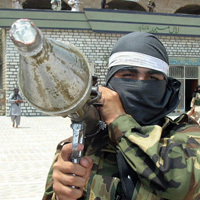 Radio Free Europe muddies the definitions with a headline story last January, Afghanistan: Are Militants Copying Iraqi Insurgents’ Suicide Tactics?. The White House, meanwhile, released a fact sheet last week, referring to Shia militants. But in a speech in the Rose Garden before leaving for the Middle East, President Bush used several terms, except militants. This term was decided upon because it describes people who are “rising in active revolt”. It is the best word to use in situations of rebellion or conquest when there is no free-standing government. That was then — when the BBC implied there’s no free-standing government in Iraq — and this is now. And now, the BBC is using both words in stories coming out of Iraq. Insurgent refers to people and groups actively battling the government or coalition forces. Militant usually refers to members of armed militias, which have a variety of agendas. The Kabul hotel attack is believed to have been carried out by Islamic militants, possibility surrogates of the Taliban insurgency. Possibly, but the terms are often used when we don’t know who’s responsible for a particular incident. BTW, I submitted the same question to National Public Radio’s ombudsman earlier this week. But she did not respond. She was answering other questions, like “What is an ombudsman.” That I can answer. It’s the person who can explain when and why a news organization uses one carefully chosen word over another. Whatever they are called they are jeopardizing our way of life in America and are a slap in face to the values that have made THIS country great. We can spend all day talking about what to call them, but that’s what they are and we have to stop them. I am proud that my middle boy is serving in Iraq. He tells me that the people he meets there love what the Americans have done for their country.